My grandma has always taught me from a young age to look after my skin and it has always resonated with me because she has such amazing skin - if I look like my grandma at her age, then suffice to say, I will be chuffed haha. 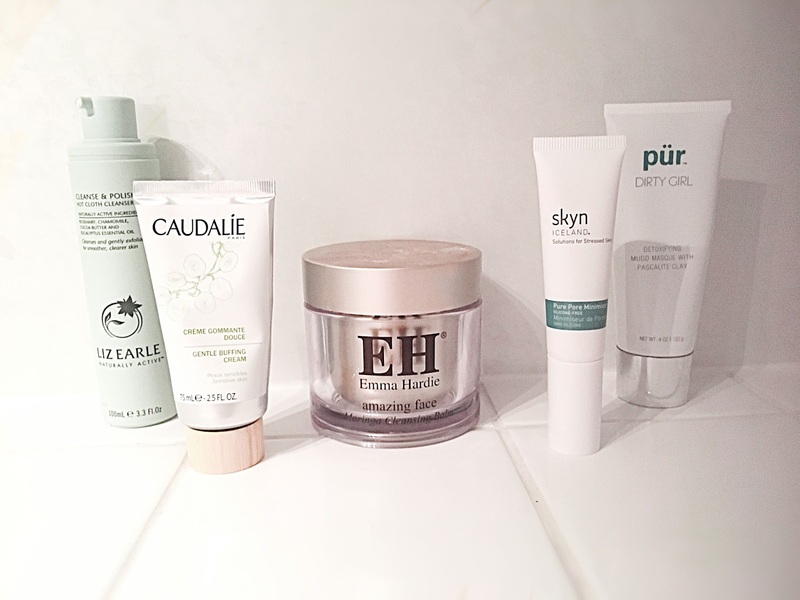 I thought I would share with you my skincare essentials that never fail. It was actually my grandma who introduced me to the Liz Earle range and I have been hooked ever since. Liz Earle's formula is so soft and gentle, which makes it perfect for my sensitive skin. The Cleanse and Polish is perfect for both your morning and evening skincare regime as it clears any impurities and remaining makeup on the skin. I enjoy using this product with the muslin cloth provided, I soak it in luke-warm water and remove my makeup at the end of the day. Due to its gentle nature it is also suitable to use on the eye area which is perfect if you have sensitivity around the eyes. This is a very gentle facial cream which is suitable for sensitive skin types and should be applied one-two times per week. I find this product leaves my skin feeling extremely soft and due to the light beads within this product it acts as an exfoliator to rid dead skin cells leaving the skin feeling more youthful and pure. The product itself seems almost fragrance free however I feel that there is a very light cucumber and herb scent which reminds me a lot of the Liz Earle ranges. This is a steady staple in my skincare regime although the price makes my bank account's heart bleed. I honestly find that my skin looks so much healthier with I use this and any spots are reduced BUT in comparison to the Liz Earle it is just too expensive so I limit this to heavier make up days so it's a more thorough removal. This is a great mudd mask to use to unclogs pores and clarify the skin whilst it gently exfoliates with a blend of deep cleaning natural clays and soothing botanicals. As salicylic acid sloughs away dead skin and debris, Pascalite - a unique form of bentonite clay - absorbs pore-clogging impurities for a visibly fresher, more radiant complexion. I do find however that if you have dry skin then this mask should be used more irregularly, I only use this once a month as I have naturally dry skin however if you have normal to oily skin you could use this mask as a weekly treatment. In 2012 I was lucky enough to go to Iceland with my boyfriend David and whilst there we went to the blue lagoon which is decked out with all the Skyn Iceland skincare, we both loved the masks and I am now venturing into more of their skincare and this pore minimiser has definitely made an impact. This is a silicone-free blemish treatment instantly reduces the appearance of enlarged pores while gradually refining skin’s tone and texture, thanks to a cocktail of highly advanced, clinical-strength natural actives and skyn Iceland's signature ‘Biospheric Complex’ – mineral-rich Icelandic glacial water, indigenous arctic berries, oxygenated liposomes, butterfly bush and thyme extracts – which works to soothe, strengthen and stabilise stressed skin. The nylon-infused formula glides on smoothly with a matte, velvety finish while argan kernel and sesame seed extracts work to balance sebum production and gradually restore skin-equilibrium. White willow bark is naturally anti-bacterial – to battle blemish causing nasties – and antioxidant ejitsu rose provides protection against the ravages wrought by free radicals. I have noticed a difference using this and I cannot wait to continuing using it. What are your current staple skincare essentials? I need to take better care of my skin, thanks for sharing these! It's so easy to neglect! No problem! I'm currently hooked onto garnier tissue masks and moisturiser! Keeps my skin so soft and young!